University Lutheran Church, Eau Claire, Wis. I believe we are all children of God and have unique gifts and callings. Living with Duchenne muscular dystrophy (DMD) has been part of my life since conception and known to me since age 3. DMD is a progressive neuromuscular disease that affects all the muscles in my body. 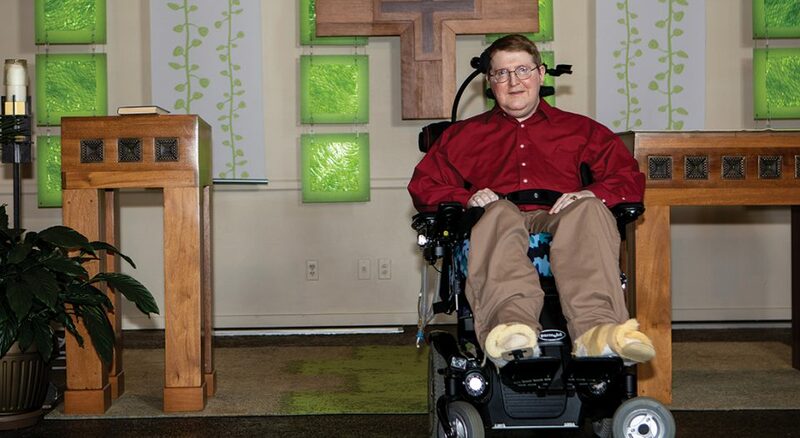 I was able to walk until I was 16 years old, when I started using a wheelchair. Today at age 40, I use a ventilator or BiPAP machine 24/7 to breathe, and I rely on others for help with all activities of daily living. Duchenne is part of who I am, but it doesn’t define me. As I’ve gotten older, I realize I have a gift from God for teaching, by example, how to live a rich and full life in spite of having DMD. I share my love for music, books and travel with others as an example of how to live that rich life even with a disability. I think I’ve done well in treating a “loss” as an opportunity to see more clearly the path God wants me to follow. I pray for all of creation and for people to be better stewards of the earth. I also pray for full communion between Lutherans and Roman Catholics. As I’ve gotten older, I realize I have a gift from God for teaching, by example, how to live a rich and full life in spite of having DMD. … I think I’ve done well in treating a “loss” as an opportunity to see more clearly the path God wants me to follow. Receiving a Carnegie-Whitney Award from the American Library Association to write “Children and Young Adults with Muscular Dystrophy: An Annotated Bibliography” was an excellent opportunity to highlight books that present the life stories of people with muscular dystrophy. The books explore the insights, social and spiritual development, challenges and personal successes of children and young adults with various muscular dystrophies, particularly DMD. I find that grace, given to us by God through the sacrament of baptism, transforms us and our bodies into a living sacrifice, holy and acceptable to God. Grace gives us the freedom to live without trying to earn God’s favor through works. Something I want people to know about living life with a disability is that I have the same needs and desires as any person. Don’t be afraid to approach me and ask questions with hospitable curiosity. I believe God-given gifts should be recognized and allowed to lead one to their vocation. If you can’t see your gifts, ask a friend to describe them for you. Sometimes it’s hard to see ourselves as clearly as others do. As president of the University Lutheran Church Foundation Board, I use my gift of leadership to guide the board of directors as we provide scholarships to seminary students and financially support University Lutheran, a congregation and designated campus ministry site of the ELCA. People are surprised that I am 40 years old, living with DMD and don’t use oxygen during the day. People see my ventilator and assume I’m on oxygen, but the ventilator just provides me a sufficient volume of room air with each breath I take. It’s important for me to be active in my congregation because we all have different gifts. Paul instructs us to not hold our God-given gifts above others. For us to function as the body of Christ, we need everyone’s gifts—not just mine, but yours and everyone else’s as well. My experience as an intern at NASA’s Goddard Space Flight Center allowed me to use my talents in the subjects of physics and library science. I was an undergraduate physics major at the University of Wisconsin–Eau Claire, with minors in library science and mathematics. My favorite pieces of Scripture are Ezekiel 37:1-14 because with God all things are possible and Genesis 32:22-32 because it shows that we can struggle with God and still receive his blessing. I’m pursuing a doctorate in library and information studies because it’s been my life goal since I was 15 to get a Ph.D. My current research allows me to give back to the DMD community that has supported my family and me for many years. My faith has allowed me to thrive and have hope for the future, although DMD restricts what I can do physically.